The Bemidji State University Tennis Team continues its 2018 season by traveling to Lakeville, Minn. and Minnetonka, Minn. this weekend. Matches will be played against Southwest Minnesota State University at 6 p.m. Friday and Minnesota State University-Mankato at 4 p.m. Saturday. The weekend marks the end of the regular season for BSU. At 7-4 overall and 5-4 versus Northern Sun Intercollegiate Conference competition, BSU is sixth in the league standings. With the top eight teams form the regular season advancing to the NSIC Tournament, BSU has the postseason sight. The NSIC Tournament will take place at Lifetime Fitness Oakdale Tennis Village Center in Oakdale, Minn. April 21-22. In its last action, March 24-25, the Beavers split a pair of NSIC matches, falling to Minnesota State University Moorhead 7-2, and defeating University of Mary 6-3. The Mustangs come into Friday’s match on a two-match losing streak after falling to St. Cloud State University and University of Minnesota Duluth. They currently hold a record of 3-10 on the season. Last season, BSU swept SMSU, 9-0, dropping just one set in No. 1 singles play. No. 2 Zoe Lindgren and No. 4 Hannah Alme won their matches without dropping a game in singles, 6-0, 6-0. The Mavericks hold a record of 4-10 this season after splitting Mar. 24 and 25 against Minnesota Duluth, 3-6, and St. Cloud State, 6-3. They play UMC Friday prior to their matchup against BSU. 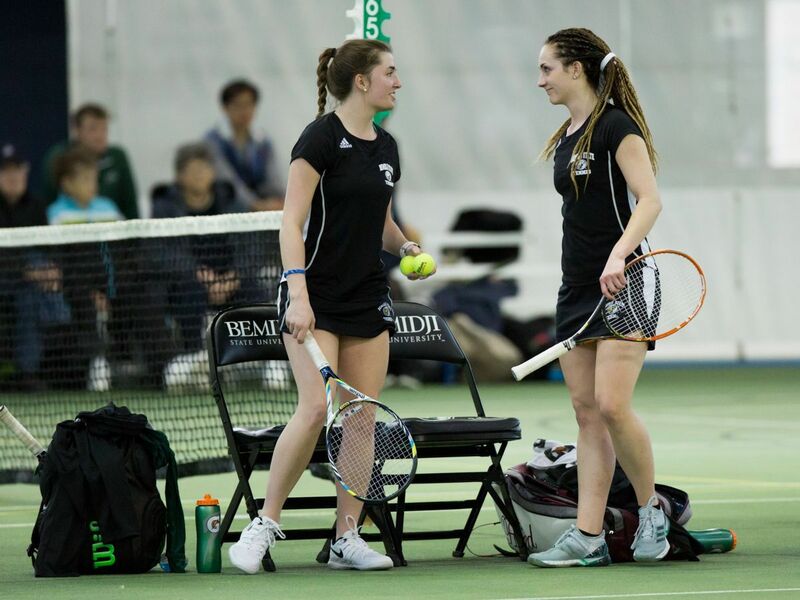 In 2017, Bemidji State fell 5-4 to Minnesota State after picking up three points in doubles play. The Beavers’ fourth point came from No. 4 singles play, where Hannah Alme defeated Monika Ryan, 6-4, 7-6. No. 3 singles went into three sets after BSU’s Adriadna Lopez-Simo split the first two sets with Minnesota State’s Melissa Washburn, who came out on top winning the tiebreaker.